Noguchi, J. (2015). “I’m a SALCer”: Influences of identity on fear of making mistakes. Studies in Self-Access Learning Journal, 6(2), 163-175. This preliminary study attempts to examine the potential factors that enable EFL learners working in an English-only self-access learning center (SALC) to overcome their fear of making mistakes when they communicate in English with their peers. Through the interviews with those student workers called “SALCers,” it was revealed that the degree of their Willingness to Communicate (WTC) (McCroskey & Baer, 1985) was quite high when they interact with other SALCers in the SALC. On the other hand, their WTC is low when they are instructed to communicate in English in their English classrooms. The findings seem to indicate that some of the distinctive characteristics of the SALC work environment free the learners from the fear of making mistakes in English. Moreover, an analysis of interviews conducted with the SALC student staff indicated they had strong identities as SALCers and a shared sense of community, which also seemed to enhance their WTC. In this paper, the prominent characteristics of both the SALC and the SALCers themselves which seem to enhance their willingness to communicate by reducing the anxiety of making mistakes will be delineated with examples. This research project took place at a language-focused university in a self-access English learning space called the SALC (Self-Access Learning Center). The center hires student staff as helpers, who are referred to as SALCers. Working at the center as a learning advisor, I believe that everyone who works in the SALC shares the same sense of mission to create an optimal English learning space for students at the university. Even though we did not directly work together, I had many opportunities to observe the SALCers confidently communicating with each other in English. This study was conducted to find out the features of the SALCers’ identity that seem to help them create an English learning community where they can interact with each other in English without being afraid of making mistakes. Since the research was undertaken based on the assumptions of a constructivist paradigm (Hatch, 2002), I regarded the research process as a place for myself and the informants to co-construct how we interpret their interactions. Sociocultural theory in language learning assumes that learning takes place through participation in social settings (Lantolf & Johnson, 2007). This view puts emphasis on the importance of learning about interpersonal interactions and social context. Hence, it is essential for L2 learners to conduct their language learning in a social setting where they can engage in L2 performance while assisting each other through meaningful and cooperative interactions (Cheon, 2008). One of the ways these sociocultural concepts could be realized is through the idea of “communities of practice” (COP) proposed by Wenger (1998). The sociocultural view of language learning and its emphasis on the importance of social context fits nicely in the framework of the COP, which is defined as “groups of people who share a concern or passion for something they do and learn how to do it better as they interact regularly” (Wenger, 1998, p. 1). Moreover, through the practice in COP described above, language learners construct their identity in relation to individual community members and the community itself (Lave & Wenger, 1991). In the COP, identity is constructed through three “modes of belonging,” which are “engagement, “imagination,” and “alignment” (Wenger, 1991, p. 173). The intricate relationships among different socio-cultural dimensions, personal affective aspects of the learning process and the identity construction of a learner is conceptualized as a framework called Willingness To Communicate (WTC), which was first introduced by McCroskey and Baer (1985) and described as “the probability of engaging in communication when free to choose to do so” (p. 546). It has been shaped into a visual representation by MacIntyre, Clément, Dörnyei, and Noels (1998) (See Figure 1). Figure 1. 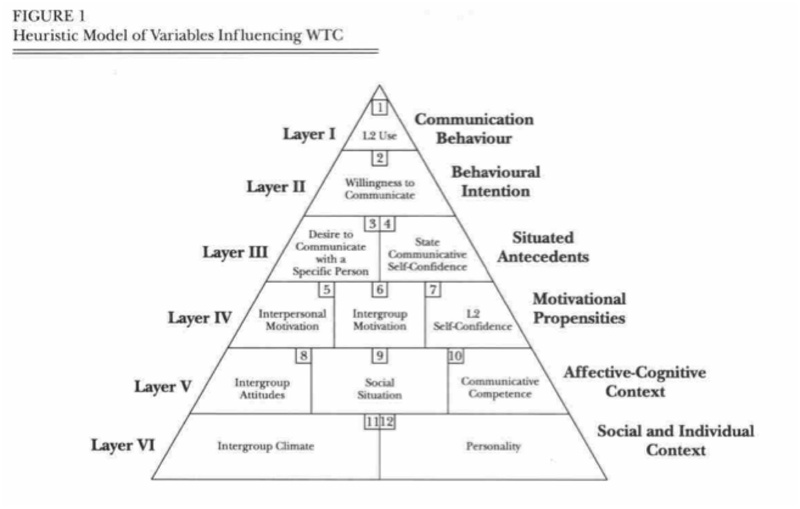 Heuristic Model of Variables Influencing WTC (MacIntyre et al.,1998, p. 547). They do not want to feel embarrassed when they did not make themselves understood. These two characteristics of collectivist attitudes and fear of shame in Japanese EFL learners will seem familiar to their teachers as being the major obstacles to encouraging students to communicate with each other in English in class. Looking at the definition of COP again, “groups of people who share a concern or passion for something they do and learn how to do it better as they interact regularly” (Wenger, 1998, p. 1), we can see that the SALC has the basic elements of a community of practice: a group of people (the SALCers) share a concern or passion for something they do (language learning and serving other students who come to the SALC) and they learn how to do these things better as they interact regularly (they help each other learn English and senior students train junior students how to do their jobs better when they work together every week). As shown in the study by Osterman (2014), it is often the case that Japanese EFL learners are afraid of not being able to express themselves clearly and correctly and therefore of not being understood. This fear was also the most often cited source of anxiety in English classes in a study by Williams and Andrade (2008). Anxiety, which is often viewed as the opposite of confidence, is considered to be one of the biggest hindrances to WTC (MacIntyre et al., 1998). What are the characteristics of the SALC and the SALCers that seem to enhance the SALCers’ willingness to communicate in English? The broad scope of this research question was intentionally constructed to allow for complex issues related to identity and willingness to communicate to emerge. In order to answer the research question above, an interview research study was conducted. The self-access learning center in which the study was conducted has a strict English-only rule, which applies to everyone who enters the space. Student helpers (SALCers) are hired as paid employees to assist with administrative tasks at the center. Their job is mostly equivalent to that of library desk staff. They have been selected from many applicants based on how motivated they are to contribute to the center and how comfortable they seem to be working in an English-only environment (regardless of their actual English proficiency level). Therefore, all SALCers are assumed to have positive attitudes toward interaction with people in English. There are also some non-Japanese SALCers, who are exchange students mainly from Korea or China, whose native languages are Korean and Chinese respectively, and who study both Japanese and English at the school. This context is quite unique and different from a classroom environment in that students are required to use English relatively more authentically to function competently in their workplace. They are paid for working there, and there are real consequences if they fail to meet the expectations from their supervisors (i.e. losing their job). In classroom settings, students are forced to communicate in English with their classmates through practice activities. However, working at the SALC does not require the SALCers to communicate with their co-workers unless there is a real need to work together in order to get some job done. Therefore, whether they socialize with their colleagues or not is their choice. Additionally, there is a well-established training system in place, as well as organized social events for the new SALCers to help them build their sense of community and bond with other SALCers. Two SALCers, K and S, agreed to participate in this interview study. K is a female sophomore student who has worked in the SALC for about a year and a half. S was K’s trainer and mentor at the SALC. These participants were chosen because they were the only ones to respond to my blanket e-mail to the SALCers asking for participant volunteers, and both showed sufficient interest in the research, as well as a sense of responsibility, by promptly and adequately replying to all of my follow-up e-mails. It should be acknowledged that as these participants represent a sample of convenience, they may not be representative of all SALCers. However, it turned out that K and S provided intriguing insights about the factors that influence their language identity. Their views had many commonalities, but at the same time their differences in years and the amount of experience working in the SALC gave me different perspectives. It was also fortunate that K and S had a very close relationship, which I found out when I was interviewing K. K told me that she decided to start working in the SALC when she saw S working in the SALC and felt that she wanted to be like her. Also, it so happened that S got assigned to K as her trainer. Therefore, they worked closely together, and K often consulted with S regarding not only work-related matters, but also with her personal problems. They had a relationship within the SALC and outside the SALC in both English and Japanese, which gave me richer data about how they regard the SALC and the SALCers. In this study, data was collected using a pre-interview survey and interviews. The purpose of the pre-interview survey was to help me understand the baseline of the participants’ (i.e. K and S) perceptions, so that in the interviews with them I could ask more in depth questions. It was also designed to elicit some demographic information about the participants so that I would know enough about them from the beginning, and I would not need to spend much time in the interview asking basic questions about the informants, such as their major or study abroad experiences. The interviews were formal “semi-structured interviews” (Hatch, 2002) with some guiding questions prepared in advance in order to gather information on how the participants view the SALC and the SALCers, and how they perceive the differences between their attitudes toward speaking English in a classroom setting and those in the SALC. Those interviews were conducted in their native language, Japanese, so that the participants could feel free to express themselves without any language barriers. They were video-taped, as well as audio-taped, using a voice recorder as a backup. In this section, I will explain which analytical tools I used in order to analyze the data. I used “interpretive analysis” (Hatch, 2002) in order to analyze the excerpts from the interviews and the video clips of the observation. I transcribed the parts of the interviews that I thought were relevant and useful to answer my research questions after watching the interview and observation videos several times. More specifically, I transcribed the parts where the interviewee talked about the differences between how they interact with others in English in class or in the SALC, the possible reasons for their differences in behavior based on their location, as well as the general characteristics of the SALC and SALCers. Once the transcription stage was done, I followed Hatch’s (2002) guidelines on how to conduct interpretive analysis. I reviewed the impressions that I had recorded in a notebook throughout the research process and modified them as I read the transcripts. I looked for salient interpretations and placed codes where those interpretations were supported in the transcripts. I put all the codes together on a separate sheet of paper and sorted them into codes for the SALC and the SALCers, as well as for attitudes toward English communication within the SALC and with Japanese classmates in class. The analysis explained in the previous section revealed some interesting emerging themes. I went over the recordings to discover the perceived characteristics of the SALC as a workplace either explicitly mentioned or implicitly suggested through SALCer utterances. I looked for themes, grouped all the excerpts that came under the themes, re-organized and renamed them. According to Lave and Wenger (1991), the experiences in different communities of practice we belong to are an important factor in our construction of identity. In this case, the characteristics of the community of practice (the SALC) and the community members themselves (the other SALCers) should definitely influence the identity of the participants as SALCers. Judging from the fact that both of the participants described how they are willing to speak in English in the SALC, but they are not in class or other contexts, it would seem that they distinguish their identities as SALCers as different from their identities outside the SALC. As shown in Table 1, their contrastive attitudes to the SALC and to class or other contexts imply that they have formed a clear identity as a SALCer. It would seem that this identity as a SALCer is the source of their enhanced WTC. Therefore, based on the theoretical understanding of identity construction as a negotiation process in relation to the community and other community members, analyzing their perception of the characteristics of the SALC (i.e. the community) and the SALCers (i.e. the other community members) can give us insights into what elements in their COP help them shape the identity that motivates them to break out of the shell of fear and initiate interactions with others in English. English-only. The first characteristics of the SALC that helps the SALCers feel more comfortable speaking in English seems to be its English-only policy. While “English-only” sounds slightly imposing, shy Japanese EFL learners seem to need a little bit of a push. Her comments indicate that she can overcome her shyness when she is in the SALC since she knows that everyone speaks in English there. There is no risk of being embarrassed by being the only person who tries to speak in English, which Osterman (2014) found prevented students from talking in English in class. In order to emphasize the thoroughness of the English policy in the SALC, S also shared her experience signing a confidentiality agreement that new SALCers need to sign before they start working in the SALC. She was taken aback to find that even the confidentiality document was in English, which made her realize that everything really had to be done in English. The fact that the SALCers do not speak in English outside the SALC proves that it is not only the people they are with, but the space where they are expected to speak in English, that is crucial for them to feel willing to engage in English communication. This assumption is supported by K’s comment stating that it is usually the case that the SALCers do not talk to each other in English outside the SALC, even though they want to speak and practice their English, unless there is a rule or necessity that they do so. Based on these observations, the SALC having an English-only policy and providing a space where it is guaranteed that everyone speaks in English seems to be one of the factors that helps SALCers feel more comfortable and willing to communicate in English with other Japanese learners of English. Everyone is equal. The second characteristic that enhances the SALCers’ WTC is “Everyone is Equal.” Both S and K mentioned that they can be friendlier and treat everyone equally regardless of their ages when they speak in English, since they are not required to be aware of the hierarchical relationships as they need to do in Japanese. K listed an example of calling someone older than her by their first name without adding “san” at the end, which she must do in Japanese. Being free from constantly paying attention to hierarchical relationships or being aware of proper language and attitudes to interact with each other, the SALC may be empowering students to communicate more regardless of who they communicate with. In addition to the characteristics of the SALC as a community of practice that helps SALCers enhance their WTC, there seem to be some characteristics of the SALCers as community members that help them feel more encouraged to communicate with each other in English. Those characteristics are namely: 1) Willingness to actively communicate and get to know each other, 2) Actively helping each other, and 3) Friendship and sense of community. Willing to actively communicate and get to know each other. The first of the characteristics of the SALCers is “willingness to communicate and get to know each other”. When asked how she would depict the characteristics of the SALCers in general, K mentioned that the SALCers are actively seeking opportunities to have conversation with and help other people in English. She also said that she herself has more confidence in actively seeking out other people to communicate with in English when working in the SALC, even though she is usually not the kind of person who does. She attributed the differences to the fact that she enjoys and takes pride in working in the SALC while using English. This seems to demonstrate lucidly how her identity as a SALCer who is required to be an active communicator empowers her and enables her to overcome her shyness. The “relationship” mentioned here, based on both improving their English and becoming better SALCers, might be the driving force behind their actively helping each other with their English. Based on the excerpts from the interviews provided above, it is apparent that the SALCers are proactively supporting one another. Friendship and sense of community. The last theme that I will introduce as one of the characteristics of the SALCers is that they are not only willing to communicate with other people, but also be their friends. There was no indication of cliques depending on SALCer interests or dispositions. K and S both stated that all the SALCers get along and are close to each other. This could imply that the SALCers are consciously making efforts to create this network of friendship to build a good community of practice. The relationship among SALCers appears to be different from other close relationships. For example, S stated that she feels awkward speaking in English with her mother or her friends who are Japanese and capable of communicating in English. It seems that just knowing each other well is not enough to make her feel comfortable speaking in English. Rather, the English-only environment of the SALC, coupled with the mutual agreement of the SALCers to be peer learners, seems to enable her to communicate in English more easily. The main characteristics of the SALC and the SALCers that seem to enhance the SALCers’ willingness to communicate with their Japanese peers in English and contribute to their reduced anxiety of making mistakes were characteristics of the SALC including: 1) the English-only policy, 2) Equality, and traits of the SALCers, including A) Willingness to actively communicate and get to know each other, B) Actively helping each other, and C) Friendship and sense of community. These findings align with sociocultural theory in that social context and interpersonal interaction plays a crucial role in SALCers’ willingness to speak in English with each other. The SALCers construct their identity through interactions with community members who share the joint enterprise of both learning English and fulfilling the demands of the job. Furthermore, the SALCers perceive the SALC as a place where everyone communicates only in English and everyone is treated equally and in a friendly manner. The sense of belonging to this community and the identity as a SALCer help them to reduce their anxiety of making mistakes, which in turn increases the level of WTC. This preliminary description of SALCer identity is based on the constructivist approach, which means a large portion of the data consists of my own subjective interpretations, co-formed through the interactions with the participants. In addition, it would be difficult at other institutions to replicate the conditions under which these SALCers work. The SALC where this study was conducted is one of the best-funded facilities of the university, and the SALCers are paid to speak English and therefore have an extrinsic motivational factor that most students do not. Additionally, they are encouraged to bond with other SALCers through a training system, as well as organized social events for the new SALCers, which surely help to build their sense of community. This makes generalizing the findings of this study to other contexts, such as a classroom setting, nearly impossible. Furthermore, this was an exploratory study based on interviews with only two participants, who were chosen primarily due to their willingness to participate in the study. There is no guarantee that they were typical “SALCers”. Hence, the conclusions reached by this paper can only be described as tentative. However, the current data does seem to indicate that an interaction between certain characteristics of the SALC and the SALCers themselves positively influence SALCers’ WTC in English. Further investigation of these characteristics may serve as a basis for better understanding of the factors affecting Japanese EFL learners’ willingness to communicate in other settings. 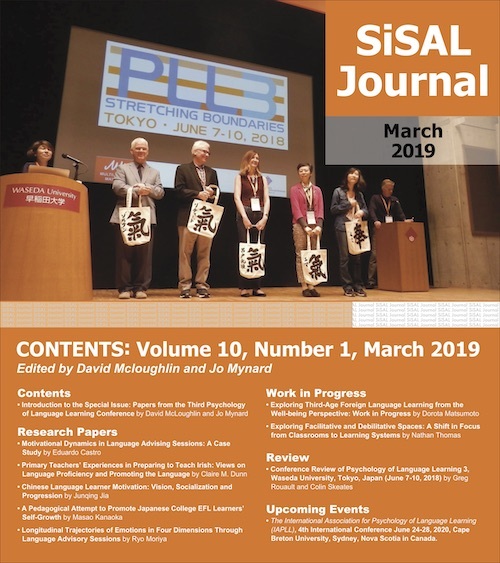 This study has shown how the identity as a SALCer and the SALC itself as a workspace seems to foster a sense of community among SALCers, which enhances their willingness to communicate. It is especially noteworthy in that the participants of this study seem to have overcome one of the most challenging issues that many Japanese EFL learners face: fear of embarrassing themselves by being unable to express themselves or use English accurately. It is hoped that further research will provide more substantial information to either confirm these interpretations or offer alternate views that explain these preliminary findings. Junko Noguchi taught at a public high school in Chiba, Japan after getting her MA in TESOL from Soka University of America, USA, and is currently working as a learning advisor at Kanda University of International Studies. She is also a PhD student at Temple University, Japan. Her research interests include articulatory phonology, self-directed learning and metacognition. Hatch, J. A. (2002). Doing qualitative research in educational settings. Albany, NY: State University of New York Press. McCroskey, J. C., & Baer, J. E. (1985, November). Willingness to Communicate: The construct and its measurement. Paper presented at the annual convention of the Speech Communication Association, Denver, CO.